Jet mud mixer is used to make and mix drilling fluid to change the density and viscosity. Drilling fluid jet mixer can do the fluid weighting and mixing for solids control system used in 1500m-9000m drilling. Jet mud mixer consists of one centrifugal pump, one feeding hopper and one jet mixer. Generally, there are still pipes and valves connecting all these parts, the mud hopper matched on the jet mud mixer always 4“and 6”. Jet mud mixer could be installed on a skid to be a separate unit, sometimes it is installed on the mixing tank and could be transported together with mud tank. When the jet Mud Mixer is independently installed on the skid, a control panel could be offered together for easy operation. According to users custom we can call jet mud mixer as jet mixing pump as well. The mixing pump can be used in HDD mud system, oil and gas drilling fluids system, coal seam drilling mud process system, mine drilling, etc. We know the HDD is similar with coal seam drilling. Since they all don’t request too large handling capacity. And the users prefer the system hold complete function including process, recycling, and mixing. Mud mixer is a single jet mud mixer combined with 45 Kw (or 55 Kw) sand pump and a jet mud hopper or a double jet mixer of two pumps and two hoppers. The weighting hopper can be combined with a pump or be used independently with manifold valves with pump. Put the drilling fluid materials (bentonites, barite powder) and the corresponding chemical additives (polymer) into circulating tank for increasing the total. 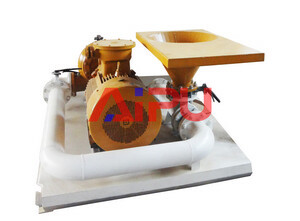 Aipu is a professional manufacturer for solids control system. We can offer other solids control products besides jet mud mixer. If you want to know more information about solid control system and oil drilling solids control equipment, please feel free to contact us. How to choose solids control system correctly ?